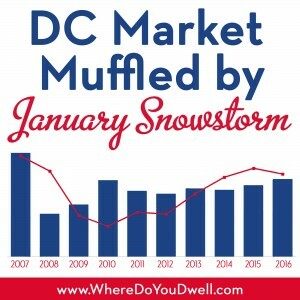 The January snowstorm forced the DC metro market to retreat to the toasty indoors, most likely causing the month’s slow down in contract and listing activities for the first time in over a year. Despite these snow days, closed sales still remained strong and were up in all property segments, according to an analysis of January market statistics by RealEstate Business Intelligence (RBI). 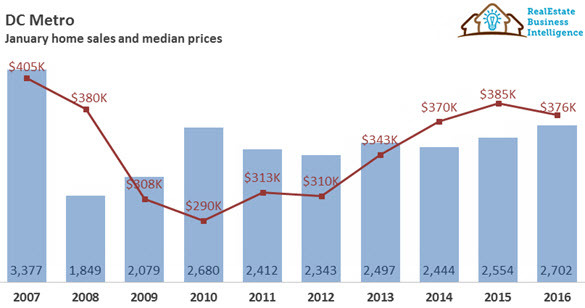 Median sales price for January saw a 2.5% decrease – landing at $375,500, which is $9,500 less than last year. Sales volume was up 2.7% from last January with $1.25 billion. Average sales price to original listing price ratio was 96% in January, up from 95.7% from the previous year. The District had the highest at 97.4%. Median days-on-market (DOM) for the region was 44 days or less, down one day from last January. The District had the lowest at 26 DOM. New listings and new contracts were down 5.3% and 8% respectively from last January – likely due to the snowstorm. The January median sales price dipped for townhomes and condos but remained unchanged for single-family detached houses. Despite the decrease in year-over-year median sales price for both December and January, prices are still 5.3% above the 5-year average and 7.9% above the 10-year average. 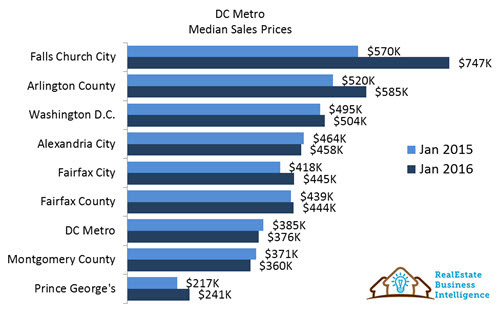 Across the region, several jurisdictions experienced increases in median sales prices: Prince George’s County ($241,000), Arlington County ($585,000), Falls Church City ($747,000), the District ($504,000), Fairfax City ($445,000), and Fairfax County ($444,000). Closed sales exceeded both the 5-year and 10-year averages for the month of January. The region had 2,702 closed sales in January, up 5.8% from 2015. All property segments saw increases. Across the region, Prince George’s County saw the largest increase in sales with a jump of 17.7% from last year, at 599. Fairfax County has the largest number of closed sales with 743, a 5.4% increase. Other jurisdictions with increases included Montgomery County at 9.1%, and Arlington County with 0.7%. The largest dip in closed sales was the City of Alexandria with a decrease of -23.8%. The January snowstorm put a -8% chill on new pending sales with 3,423 contracts, that’s 6.8% below the 5-year average and slightly below the 10-year average. All property segments saw decreases in the number of new contracts compared to last year. Across the region, Fairfax County has the most pending sales but was still a decrease of 6.2% from 2015. Fairfax City was the only jurisdiction with an increase, at 38.9%. Falls Church City saw a -53.9% dip; Alexandria City -22/.6%; Arlington County -14.0%; the District -12.1%, Montgomery County -8.4%; Fairfax County -6.2%; and Prince George’s County -2.9%. New listings of 4,025 were 2% below the 5-year average and just slightly above the 10-year low of 4,004 in January 2013. Again, the snowstorm is the likely culprit for -5.3% dip in new listings across the region, except for the District’s 11.9% increase. All property types took a hit from the snow days with single-digit YoY decreases. Across the region, Fall Church City experienced the largest decrease at -33.3%; Fairfax City -17.2%; Arlington County -15.4%; Alexandria City -10.6%; Fairfax County -8.5%; Prince George’s County -6.2%. Overall inventories increased to 8,277 at the end of January, which is slightly above the 5-year average of 7,823 but below the 10-year average of 12,330. Both single-family detached homes and condo inventories (active listings) were up, but townhomes were down compared to last year. Across the region, the District saw the largest increase in inventories with a 16.3% increase to 1,114 active listings. Fairfax City and Fairfax County has the largest decrease of inventories compared to 2015 with a drop of -46.7% and -13.6% respectively. Sellers got an average of 96% of their original list price for the final sales price, slightly up from 95.7% last year. Across the region, these jurisdictions saw an increase in the SP to OLP ratio: District, Prince George’s County, Arlington County, Fairfax County, and Montgomery County. Alexandria City has a slight 0.5% decrease to 96%. Both Fairfax City and Falls Church City has the most significant decreases. Median DOM was 44 days across the region, but significant differences among jurisdictions, with the District at only 26 days to Falls Church City at 92 days. Most jurisdictions did not experience a large difference in the DOM compared to last January, but Fairfax City dropped from 54 to 28 days and Arlington County dropped from 53 to 41 days. Prince George’s posted 32 days, Alexandria City 51 days, Montgomery County 55 days, and Fairfax County 56 days.